Make Jay Do It In A Dress! Help Make Jay Do It In A Dress! I was turned on to the DoItInADress charity last month while attending a conference in Portland on pain neuroscience (that’s a completely separate blog post, by the way…). Our presenter, one Lorimer Moseley, put this video up at the end of the second day. It’s a very compelling look at the life a girl living in poverty in Sierra Leone (and many other under-developed countries) faces when she turns the ripe old age of 12. In short, the vast majority end up either married or in prostitution, never finish school, have their own children soon after and the cycle repeats. Lorimer went on to tell us that he is active with a charity group called ‘Do It In A Dress’, the purpose of which is to support keeping girls in school, targeting again Sierra Leone (it’s a small charity), but with partnerships with other organizations in Africa. You can read more about this great organization here. 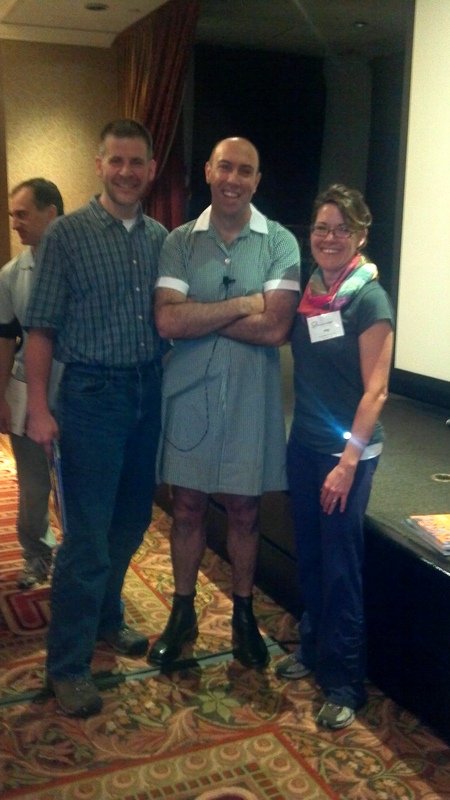 He then threw the gauntlet down to the conference attendees – if we raised $1500 for this cause before the course started the next morning, he would teach the last day of the course in a schoolgirl dress. The conference attendees contributed over $6000 that night, and Lorimer was true to his word. 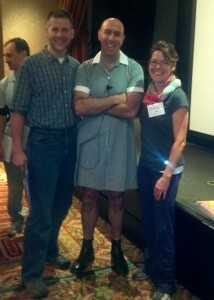 Here’s a picture of him with Amy and I, just to prove it (and so you can see the adorable dress!). So, I believe that if a room full of PTs can raise six grand in about 12 hours, then surely patients and friends of our clinic can manage a thousand in a week. And if you do, I’m going to treat patients in a dress all day on Wednesday November 14th. It’ll be a nice gingham dress, a bit like Lorimer’s, though I don’t know what color yet. So if you want to make me have cold legs for a day and contribute to a great cause, please take moment to visit http://doitinadress.com/Jay. And thanks again to all of you.